Enteritis results in disrupting the absorptive capacity of the small Intestine resulting in reduced growth rate and high FCR.Conventional treatment treats the cause but fails to reverse the absorptive capacity in Intestine. 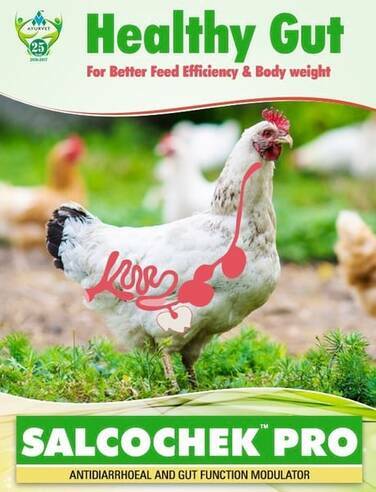 Here comes the Natural Innovative solution SALCOCHEK PRO which is scientifically prepared from herbs and essential oil that not only arrests the cause but also improves the absorptive capacity of the Intestine Improving the Growth rate of the Poultry and normalising the FCR so that there is no significant loss to the farmers. For healthygut functions & preventing loose droppings 0.5-1 kg/ tonne of feed. For treatment of disturbed gut functions and loose droppings 1-2 kg/tonne of feed.